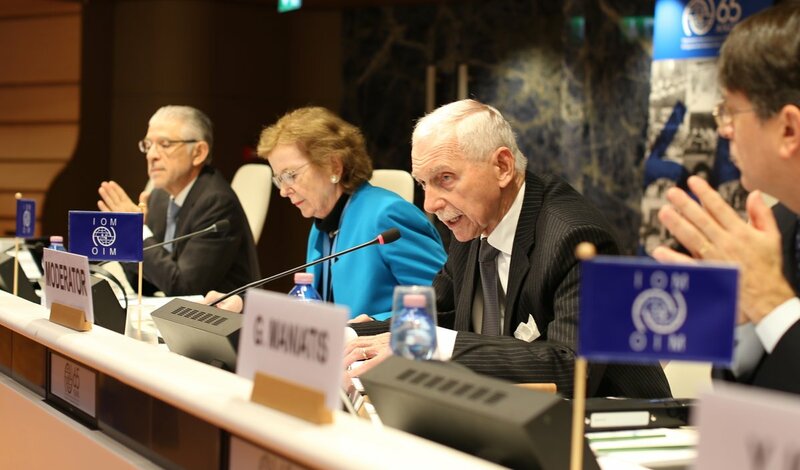 There is a major movement of people across the globe “driven by war, economic disparity and the ravages of a changing climate exacerbating already over-taxed resources,” Mary Robinson told a panel discussion as part of the 107th Session of the International Organisation for Migration (IOM) Council in Geneva. Mary Robinson was taking part in the panel entitled ‘Global Compact for Safe, Orderly and Regular Migration – From Process to Substance’. The Global Compact for Safe, Orderly and Regular Migration was mandated out of the New York Declaration for Refugees and Migrants. This is the first session of the IOM Council since the organisation joined the United Nations and marks the 65th anniversary of IOM’s founding. The Compact must recognise that “climate displacement is an issue of justice, and that migrants moving as a result of the impacts of climate change, or of related issues exacerbated by climate, will – in large part – represent the most vulnerable in society, and the least responsible for the causes of climate change,” Mary Robinson said. She added that the Global Compact for Migration “must recognise that climate change and human rights are cross cutting issues that will be intrinsic in ensuring a fair and just approach to migration in the face of an increasing threat”. Mary Robinson proposed that the Compact should recognise the link between climate change and migration. “Including climate change as a key driver of migration, now and in the future, and noting that the most effective way to limit its impacts is to achieve the 1.4 degree goal set out in the Paris Agreement,” she said. It should note that “all migrants are covered by human rights, and that people displaced by climate change may need differing rights protections from other migrants”. It should also “note and engage its place within Agenda 2030, and in doing so recognise that responsible and orderly migration is a central component to reducing inequalities and achieving sustainable development, and that it is indivisible from the wider goals, including combating climate change,” Mary Robinson added. “The full weight of history is on our shoulders and the gaze of the future is on our actions,” Mary Robinson said. She concluded by quoting the Universal Declaration of Human Rights that the ‘recognition of the inherent dignity and of the equal and inalienable rights of all members of the human family is the foundation of freedom, justice and peace in the world’. The panel was moderated by Director General of the IOM, William Lacy Swing and the panelists included Gregory Maniatis, Senior Adviser to the Special Representative of the UN Secretary General for International Migration, Mr Raúl Heredia, Deputy Permanent Representative. Permanent Mission of Mexico to the UN in Geneva and Yasushi Iguchi, Professor, School of Economics of the Kwansei Gakuin University, Japan.